QUALITY: Don’t be fooled by Chinese knock-offs, our solar panels withstand the elements and can even be punctured by a nail and continue to work. Patented to give you the faster solar charge on the market. TRAVEL SIZE: The most Portable solar charger available on the market. 33% lighter than the competition, roll it up for hiking, camping, and a day at the beach. Don’t let your phone, headphone, or other portable device run out of battery. ZERO WASTE: Our zero-waste packaging allows you to conveniently transport your SunSoaker, while ensuring its contents remain together. Capture the power of the sun and charge all day. Our goal zero waste. 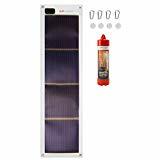 SOLAR KIT: Flexible solar panel, 4 carabiners, 4 suction cups, and USB port. Our solar charges are meant to keep your device running anywhere and everywhere.